Shop for official personalised football gifts for your favourite football clubs & teams. 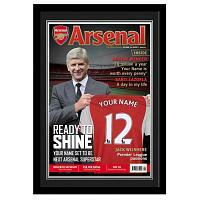 Choose from personalised football gifts including personalised football mugs, personalised photos, magazine covers & more. Personalised football gifts are ideal for birthdays & anniversaries. Order your official personalised football gifts with us today.